This recipes appeared in the Summer 2008 issue of Texoma Living!. Combine ingredients and stir to mix completely. Serve over ice with a lemon wheel or a lemon corkscrew. *Simple syrup is equal parts granulated sugar and water mixed until completely dissolved. 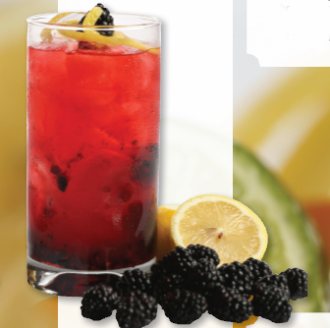 Summertime is the perfect opportunity to use the freshest in-season fruits and add them to traditional lemonade for a spectacularly cool and flavorful drink. Simply place the desired fruit in a 14-16 oz. glass. Muddle the fruit (see page 58 for instructions and safety precautions) until well broken up to release all of the flavor. Try not to completely pulverize the fruit. Add ice and fresh-squeezed lemonade and stir to mix in the fruit! You’ll like the taste and the colors created. Experiment with different fruits and proportions to invent your own family faves. Note: All recipes shown are for a single 14 oz. serving in a glass filled with ice. Fill a 12-14 oz. glass with ice, add fresh-squeezed lemonade. Then, squeeze the fresh orange and lime juice on top. Stir to mix the juices.